How to connect Facebook Group to OneStream? Why I see OneStream branding on Facebook? How does Facebook display title & description for live streams? How do Facebook notifications work? Following message is displayed if the Facebook social account (Profile, Page or Group) was connected to OneStream using a different Facebook user. This secures your social account and can be used by only authorised logged in Facebook user. Make sure popup blocker is disabled on your browser, if enabled, it will stop Facebook login window to appear. Login with the correct associated Facebook user (i.e. the Facebook user that you used to connect this social account. Now click the social account again and continue with scheduling your live stream. 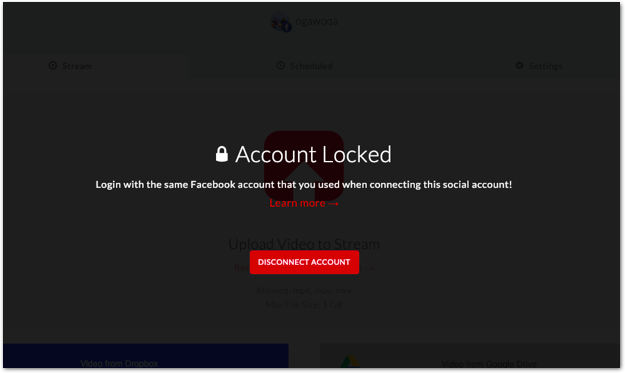 If you wish to disconnect this locked social account from OneStream, simply click DISCONNECT button.